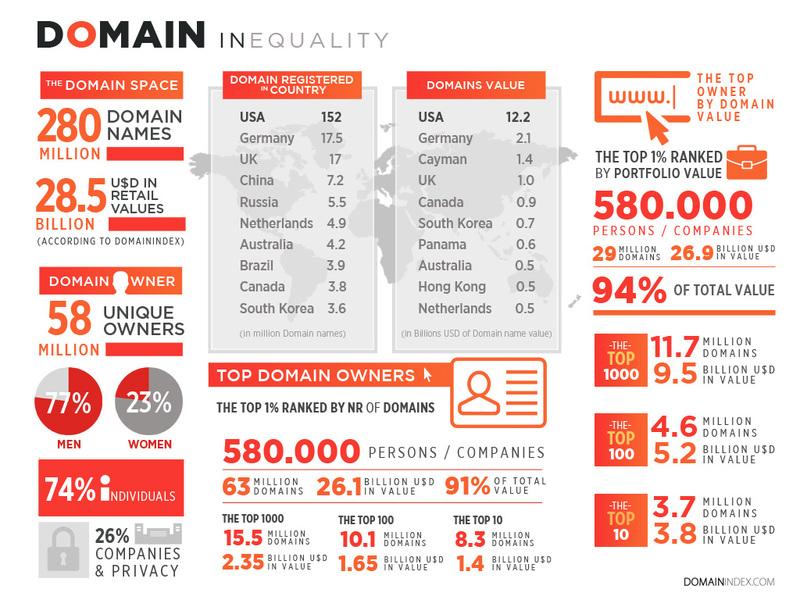 The inequality topic is all over the media right now and we wondered how is wealth distributed among domain owners? Since we have all the data available at Domainindex we decided to spend some time to put this together and find out. First a little disclaimer about the way we crunched the data, one of the most challenging tasks was to find out the top 10 and 100 owners. Only because we know many of them and we know how and where they are registered we have been able to figure out which domains belong to whom. The data is not perfect but we believe the quality is acceptable for such a statistic. About men and women ownership we used the first names in a very large sample. The total of domain names also includes free domains and many subdomains that also have value. The number of pay for domains without subdomains are around 260 Million as of May 2014. One more thing to keep in mind is that the values used are the ones from Domainindex and we do value Trademarked domains as well because we believe they do have value and some of them have very high value which ads to even more wealth concentration. 1) The high concentration of value in the first place, it clearly shows what we have been thinking, that the majority of good valuable domain names are in the hands of few. 2) The number of unique domain owners is 58 Million persons, if we leave aside free domains and subdomains, the number even sinks to 52 Million and I assume that many people even use multiple ID´s to register domain names, so the actual number might even be lower. So what that means is that on a global scale, few people actually do own domain names. Much less than 1% of the world population, much less than Facebook users, twitter or even, whatsapp or Instagram users. It still looks like we are far away from promoting domains really to the public.